Just like Bradford's FA Cup dreams, we can call it a day for this live text I think. Thanks for reading, watching and interacting with us today. Reading manager Steve Clarke told BBC Sport: "The third goal was the one that clinched it for us. At two up you're always nervous. It's a long time since we've been in the semi-finals as a club, but before then we've got some important games in the league, we need to get some points. "It's not about vindicating my decision to make the changes I did, it's about what's best for the team. It's another big pay-day for a club that's been struggling financially for a couple of years, and it's a nice thing for the new owners who've just come in. "Everyone connected with the club thought we'd be challenging to return to the Premier league but that's not happened for whatever reason and we'll hopefully be more competitive next season. The players are delighted to do their job, I don't know if there'll be too many celebrations at this stage." Bradford manager Phil Parkinson told BBC Sport: "We got off to a bad start and it was difficult to come back from that. We gave them a huge lift and on the night and they deservedly went through. "Our players have got to be immensely proud of what we've achieved this season, and we've to to take this through to the last 11 games in the league to see what we can achieve. "We just couldn't get going after that start we made, and the sending off didn't help us. After that, it was damage limitation." The semi-final by the way will be on either 18 or 19 April at Wembley. Reaction from both managers is incoming on this page if you want to stick around just a few minutes longer. You have voted Reading striker Jamie Mackie - on loan from Nottingham Forest - as the man of the match in tonight's game. Reading co-chairman John Madejski told BBC Sport: "I knew jolly well that Steve Clarke had done his homework and I knew we'd win. There'll be a heck of a lot of celebrating in Reading tonight. Fellow chairperson Sauima Skrivorn: "I'm very delighted. We played so well. It's great to win." Jason Roberts: "Bradford could have tried to stay in the game better. They fell into the trap but Reading did an exceptional job." Danny Murphy: "Steve Clarke gave Bradford the respect they deserved. He noticed where their strengths are. It was tactically spot on. They didn't have a Plan B. Dean Saunders: "The Bradford manager is a hero. All the players are playing every week. The form is starting to suffer in the league. Some of their players are in tears but they shouldn't be." Dom Marsh: Reading fans on the pitch, it will be called magical. When Villa did it, it was a disgrace. Villa did it before the game was over! The BBC pundits are talking about Filipe Morais's red card. Dean Saunders says "it's a ridiculous tackle, a lack of discipline. It ended Bradford's hopes". Jason Roberts: "Initially I thought he only had eyes for the ball but on second viewing he made a stamping motion. There can be no excuse." Danny Murphy: "The game was dead once that happened. Reading had enough quality to keep the ball." 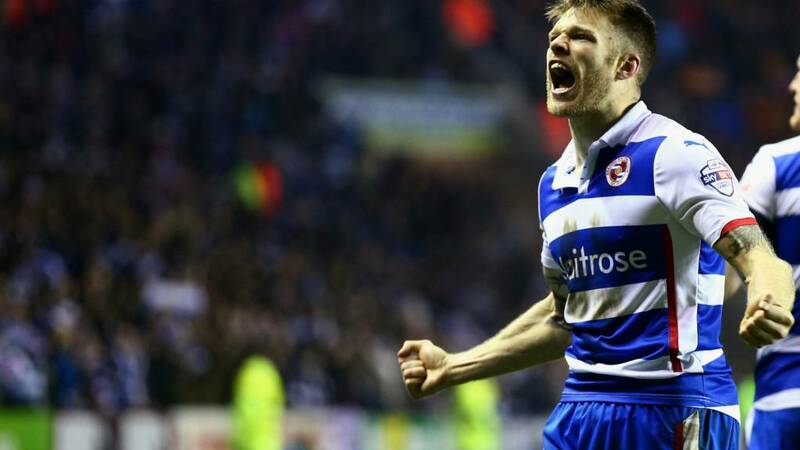 Reading goalscorer Jamie Mackie told BBC Sport: "It's massive for the club. I'm 29 and have never played in an FA Cup semi-final. You dream about playing in the FA Cup final as a kid when you're playing football in the garden. We had a good game plan. We started brilliantly, it set us in good stead. "It was ours to lose at half-time. To get a draw up at Bradford was an unbelievable result - and we backed ourselves tonight. "It gives us a different focus when we've had a tough time in the league. At least we've put some smiles on faces. "My wife had a baby on Friday so I had to kip in the other room last night but it'll be nice to spend time with the family tomorrow." Some Reading fans come onto the pitch. And then some more. There's hundreds now. Some blue smoke on the pitch too. Unlike Aston Villa fans recently, Reading's supporters waited for the final whistle. Reading will face Arsenal in the FA Cup semi-final at Wembley. Bradford go back to their League One play-off bid. Chris in Bradford: Think my backside is safe! If you missed it earlier, Chris pledged to get Phil Parkinson's face tattooed on his backside if Bradford recovered to win this match. BBC pundit Martin Keown says it'll be tough to work out which side to support in the FA Cup semi-final as Arsenal, his former team, face Reading, whom his son Niall plays for. Who has been the star performer tonight? And now we have our final switch, Yakubu comes on for Pavel Pogrebnyak. "Yakubu deserves this" after scoring in the last round, says Martin Keown. Reading make another change - Oliver Norwood replacing another goalscorer Garath McCleary. Steve Clarke presumably made his changes separately so players could get their own ovations from the crowd. Now they're getting another change ready! Cop on Steve - we all want to go home. Bradley Hill: At the end of the day, Reading wanted it more. You can now watch Jamie Mackie's goal in the highlights tab on this page. Back at the Madejski Stadium and Nick Blackman replaces goalscorer Hal Robson-Kanu in Reading's first change. you can do so here. Jordan Henderson has just given the Reds the lead. live on Roma v Sampdoria if Serie A is more your thing - Samp lead that one. Reading are 10 minutes away from a Wembley semi-final against Arsenal. Bradford know the game is gone, there is no sense they might even score one. You can now watch Filipe Morais's red card in highlights to see if you agree with Martin Keown or Joey Barton (see the entries around 64 minutes). Philip Cullinane: The worst match on the worst pitch refereed by the worst ref that I can ever remember. How did Chelsea get beaten by Bradford? This can only be the worst match you've ever watched if this is the first game you've ever seen. "Phil Parkinson wants to fight the world. Had a real go at Nathaniel Chalobah as the player went back on the pitch after having his hip raked." There's now a pitch invader, which the informal rules of broadcasting say we're not allowed to see. He appears to be doing gymnastics, I can just about see him in the background. Stewards have got him now, we can get this game back under way. Final change for Bradford as Matthew Dolan replaces Billy Knott in midfield. Knott looks devastated on the bench. Reading haven't made a change yet. The only other time Reading reached the FA Cup semi-final (1927), penicillin didn't exist. "Look at that for a pass from Nathaniel Chalobah, and Jamie Mackie is clinical, he does the rest. This man Mackie is inspired tonight. And who says Steve Clarke isn't animated? Look at that celebration. I feel sorry for Phil Parkinson, his side have been magnificent in this competition so far but this was one step too many for them." Lee Byatt: Well worked goal for Reading. Bradford's passing has been average at best. Too many loose balls. "It's a typical Jamie Mackie goal. It's a great ball into him. Knowing Jamie so well, I thought: 'He's going to hit the target for sure.' He practises and practises and practises. I've got to have a pop at him over his celebration, though. He always does that silly little dance when he scores. He just hasn't got any moves." Reading are on their way to Wembley, no doubt about that now. Nathaniel Chalobah slips the ball through to Jamie Mackie, who takes two touches and hammers the ball through the legs of Bradford keeper Ben Williams. Great goal. "It's a huge disappointment for Bradford fans. Their team just hasn't turned up tonight. They need a moment of inspiration from one of their players now." Slight difference of opinion there from our two pundits. Maybe no surprise to see Joey Barton defending a slightly dangerous tackle. Although Martin Keown was no angel either! "I'm not sure how much Filipe Morais knows about that. There didn't seem to be any malice. His eyes are on the ball. It's a silly challenge, but it's a harsh red card. Mike Jones went to his back pocket very quickly. He didn't give himself time to think. I'm surprised he's done that. It's ruined a competitive cup tie. It's sad. Morais doesn't deserve that." "Filipe Morais had absolutely no chance of winning the ball there. There's simply no other decision for the referee to make, it's a crazy challenge and he has to send him off. As if it wasn't difficult enough for Bradford to turn this around." Nathaniel Chalobah looks in pain and gets some treatment, he looks OK to carry on though. Some water bottles are thrown down onto the pitch. Not what you want to see. That might be that for Bradford. Nathaniel Chalobah controls the ball and Filipe Morais, with studs dangerously up, catches the midfielder in the stomach. The 10 men have 27 minutes to score two goals. London Irish play at the Madejski Stadium and if Nathaniel Chalobah played for them, rather than Reading, he'd have just scored three points with his free-kick. Miles over. Lewis Coombes: Garath McCleary giving James Meredith all sorts of problems. Reading controlling the game. Looking good for the Royals! Billy Clarke and Mark Yeates had been standing on the edge of the pitch for about four minutes waiting to come on there. The ball must have went out two or three times after they stripped off. Perhaps Phil Parkinson was deciding whether to bring off Jon Stead or James Hanson up front. Bradford make two changes - striker Billy Clarke and midfielder Mark Yeates are on. Coming off are Jon Stead and Andy Halliday. Stead had scored in every round of the cup up to this stage. Reading defender Michal Hector is down injured after getting a James Hanson elbow to his face. He gets to his feet though after some help by the physio. "I think when they play at home, Bradford's pitch almost sorts their style of play for them in that they don't have to pass the ball too much, and play the ball in the air instead." "Bradford just can't get into their game plan. It's clear they want to get the ball into the front men as soon as they can. Reading are getting pressure on the ball. Jamie Mackie and Pavel Pogrebnyak are closing down Bradford's players, and Reading are turning over possession easily." Bradford's James Meredith is given the most obvious yellow card ever as he slides in and takes Garath McCleary out of the equation without getting anywhere near the ball. "Garath McCleary needs to add that little bit of quality in the final third, and then he can be a really good player. He's got the talent to do it." The 27-year-old winger, who is now a Jamaica international, only came into the Football League with Nottingham Forest in his early 20s after playing in non-league. "There's no need for Bradford to panic just yet, but they need to more the ball a lot quicker than they are doing. Their players are contemplating whether this run is coming to an end, and their coaches want to see a reaction on the pitch." Bradford have a free-kick as Nathaniel Chalobah climbs all over James Hanson. The set-piece is beyond everyone though. However, Hanson wants another free-kick on the edge of the area as he's pressured by Alex Pearce as the ball comes through - didn't look a foul to me. Or the ref. Hanif Noor Jamie Mackie had been really standing out for Reading today. Bradford need to move the ball quicker and pick up the tempo. "Reading have got to be professional and keep taking the game to Bradford. Jamie Mackie hasn't stopped harrying and chasing all game. He's a great example." Three-time FA Cup winner Keown spoke about his experiences in the tournament at half-time, you can watch his thoughts using our highlights tab if you desire. Reading on the attack straight away and Jordan Obita whips in a cross, which is cleared. And we are under way at the Madejski Stadium. Players are back out on the pitch. Just about ready to go. No changes from either side. Reading winning in terms of actual goals, possession, shots, efforts on target and corners. But at least you have fouls, Bradford fans. Chris in Bradford: If Bradford can turn this around in the second half, I will get Phil Parkinson's face tattooed on my backside. The man would be a god, it'd be the least I could do. "Reading started the game much better. They set the tempo from the first couple of tackle - sending the message to Bradford: 'You're not going to cause an upset.' They fully deserve the 2-0 lead. "It's sad that Bradford went 2-0 down before they started putting themselves about. Once they did that, they got a foothold, but it's a tough test for them now, against a good Championship side - one who I feel are underperforming in the division." Nick Murray: Martin Keown says Bradford look tired. They didn't play a second team on Saturday, unlike Reading who got stuffed 4-1 by Watford! "It's going to have to be a monumental team-talk from Phil Parkinson to rally his troops on this one. If anything you think there's more to come from Reading. They look like they can go through the gears whenever they want. "The way back into this game for Bradford is to get it into James Hanson much more in the second half. " Reading are halfway towards a second FA Cup semi-final in their history, and a first in 88 years. Two minutes added on. And Reading keeper Adam Federici touches the ball for almost the first time. Billy Knott tries to whip in a low cross but it's saved by the Australian. "Looking from up here, you can see how compact Reading are. When they lose the ball, the centre-forwards drop deep and get behind the ball, because they know they've got the pace to break forward again when they get it back. Bradford look spread out. They can't get in the game. They've got to do something, or they're going to be in for a tough second half." "Bradford's spirit seems to have been knocked out of them. Phil Parkinson won't be able to get them back in the dressing room at half-time quickly enough." "If you're playing in midfield for Reading tonight, you have the easiest job in the world: You get the ball and pass it to Garath McCleary, because he is causing Bradford all sorts of problems down the right-hand side." Garath McCleary again cuts in from the right, but this time there's no-one to deflect his shot in so it goes wide. Bradford boss Phil Parkinson really needs his side not to concede another before half-time. He has to make some tactical tweaks if not substitutions. "Phil Parkinson probably just wants to get in at half-time, readdress things and come up with a second game plan, because the first one's gone out of the window. They have got back to it a little bit - Alan Sheehan's hit a couple of balls at Hanson, and they've got runners in around the big men. They need to do a bit more of that. "The two Reading centre-backs, Alex Pearce and Michael Hector, are very good in the air, but lack a bit of mobility. Bradford need to test that more." "Billy Knott is Bradford's most creative player, and he hasn't seen anywhere near enough of the ball for them. The energy seems to have drained from Bradford, they've lost the cup fever and seem to be suffering from fixture congestion. To play two games in three days is ridiculous." Ian Stoddart: If this ends 11 aside I'll be amazed, both teams winding the referee up, someone will go. Adam Foster: Well done ref for booking the Reading player for back chat more - should do that in the Premier League. You can now watch Garath McCleary's second goal as well as Hal Robson-Kanu's opener using the highlights tab. You can also scroll across to any moments from the game in the live tab. Only moments that have happened so far, I should add, there's no viewing the future option. "Nathaniel Chalobah has impressed me. It's been a good bit of business getting him in by Reading, and for his club Chelsea, as well." Bradford have barely created a chance and striker James Hanson just heads another long ball out of play. Hanson and Jon Stead are two big lads up front but they're not getting anything out of this tactic so far. "Is the referee losing it? Does the game deserve so many bookings? He just needs to calm this down." And a third player is booked, Alan Sheehan leaps over Jamie Mackie and falls down on top of the Reading striker, maybe hitting him accidentally with a boot. Yellow seemed a bit harsh for that. Moments later, Mackie wants a penalty after he goes down following another challenge by Sheehan. Nobody else seemed to appeal though. Broken Swenglish: Bradford's gameplan: Launch it. Reading now have Danny Williams booked - also for dissent in a different incident. "Jamie Mackie works tirelessly for Reading. And the bad news for Bradford is that Pavel Pogrebnyak is exactly the same - so he keeps up the pressure when Mackie's having a bit of a breather. It's setting the tempo for the whole team." When I said Bradford needed something, I didn't mean a yellow card. A few players from each side grapple in the box and a free-kick is given. Billy Knott is booked - I think that was for moaning rather than being involved in that Royal Rumble. "You can just see the confidence in the Reading side. Winning their last home game gave them a massive boost going into tonight." Steven Darby plays another one of these long balls that Joey Barton was just talking about. Michael Hector is easily able to deal with it. "The kind of ball that's going into Bradford's front men, you'd expect Alex Pearce and Michael Hector to deal with them. They're high balls, a bit aimless. You would fancy Championship centre-halves to mop those up, and they've done that so far." Bradford really haven't got going. It's still Reading doing most of the attacking. Is this going to be an anti-climatic end to their cup run? If you've missed what has been a highly eventful opening to the match, we've got clips of the best moments going into the highlights tab at the top of this page. Hal Robson-Kanu's opener is in there now. Matt: Bradford fans chanting "We've been 2-0 down before" and "Are you Chelsea in disguise?" Top class from them, Bradford aren't out yet. "We perhaps underestimated the pressure Bradford were under coming into this game. With the teams they have beaten in the past couple of years, there's a weight of expectation on them. "They're up against a Reading side who are much more fluid from the first match and they're knocking it around very, very confidently. "Phil Parkinson's team need to dig deep now and try to change the way this match is going. It's been a dreadful start. But if you go to Chelsea and you win there, then you can come back from this situation." "The confidence is flowing through Reading. They're popping it about and finding angles. Bradford have got to get higher up the park. Reading look as if they can cut through them at will." It is almost game over as Danny Williams smacks one in from 25 yards but namesake Ben, in the Bradford goal, gets an outstretched arm to it to keep the Bantams in the FA Cup. Even if everyone just sits down on the pitch for the final 72 minutes, it's still been a better game than the first game where there was only one shot on target. "Reading's Jason Pearce is playing so soon after breaking his nose. I remember doing that as a player, having the operation on the Monday and then playing on the Saturday. He's a brave boy." Corner to Bradford, but it comes to nothing. Phil Parkinson is trying to encourage his players but they look shocked. "The fact that Reading were able to rest everyone at the weekend is a big factor. They're fresh and have started this game ever so well." Bradford are pushing from promotion from League One, whereas Reading are in Championship midtable. Michael Smith: #bbcfacup Oh dear, Bradford. I feel like switching off. to beat Chelsea 4-2 in round four. Can they pull out another famous comeback here? "I'm disappointed for Bradford. The fans might has well have stayed on the motorway. The team haven't turned up so far." "You have to say Garath McCleary's been threatening to do that. In the end it takes a lucky deflection but give Reading credit. That's the kind of luck you need in the Cup, and Steve Clarke is really celebrating now. He couldn't have expected such a start." Is the cup dream over already for Bradford? Garath McCleary cuts in from the right wing and his shot takes a huge deflection off Andy Halliday, flies up in the air and lands just past the arms of keeper Ben Williams into the net. Bradford have their first chance of the game as Jon Stead pings in a cross to James Hanson. Unfortunately for Bradford, his header is easily saved by Adam Federici. "Reading have got big boys, and they can threaten at set-pieces. It's a great ball into the box, and it's asking to be headed. Bradford will be kicking themselves at conceding from the first set play of the game, though." "Robson-Kanu just gets in front of his marker, gets a touch and once he does that the keeper can do nothing. Fantastic start for Reading." The man who sounds like a Championship Manager regen player, Hal Robson-Kanu, just gets an inch on defender Stephen Darby and heads home from eight yards out from the resulting corner. Hal Robson-Kanu pings in a cross to Pavel Pogrebnyak but it's headed clear by a Bradford defender. The game's been bitty so far, although Reading are just starting to find some space and Jamie Mackie wins a corner. Rodger Condon: Disappointing there's no Billy Clarke in the starting line up. Come on Bradford. "Reading's Jamie Mackie is confident at the moment given the goal-scoring run he's on. Expect him to shoot from distance when he gets it." Mackie has scored three goals in the past five games. Reading's Garath McCleary has the first shot of the game but it's well off target. There was only one shot on target in the 90 minutes at Valley Parade. The pitch for the first meeting at Valley Parade was poor but this doesn't look much better. Rugby club London Irish play at the Madejski Stadium too. Bradford boss Phil Parkinson gets a good reception from Reading's fans, whom he represented as a player for 11 years. Reading manager Steve Clarke told BBC Sport: "It's a competition where we've been under the radar from the third round. We've not had many glamorous draws and Bradford deserve the spotlight. "They've done incredibly well. As a manager you want to be as good as you can be, and if taking a team to Wembley for a semi-final is the next step on that road, then it looks good on the CV." Players out on the pitch, sounds like a great atmosphere at the Madejski Stadium. We're almost ready to go. Crawley manager Dean Saunders on BBC Match of the Day: "I'm really surprised Phil Parkinson hasn't been picked up by another club given the record he's got at Bradford, in terms of knocking big clubs out of cup competitions on a limited budget. He's won a promotion with them." Shohan Sen, from Kent: As an Arsenal fan, I hope to meet Reading at Wembley in April! Bradford would have nothing to lose against a Premier League top dog, whereas Reading know that Arsenal are only a division away, and are more likely to play each other sooner (and maybe take their foot off the gas). And of course we have 10 wins out of 10 against Reading, while there are still small scars of our last match against Bradford! Bradford manager Phil Parkinson told BBC Sport: "Even though it wasn't the most fluent game, the qualities in the first match with Reading were there in terms of the honesty of both players, that's the way it should be. "There was no-one rolling around on the floor trying to earn free-kicks. If we play as we want but still don't get through, then I'll still be happy. "We go down there as the underdogs with nothing to lose." "I'm surprised there's no Billy Clarke playing for Bradford tonight. Billy Knott is a wonderful player for them. He should be playing at a higher level. "The pitch here is a lot better than it was at Bradford. I expect there to be a lot more football played tonight." "Reading need to be more forward-thinking in this game. They were a little bit negative in the first match. It's an opportunity for them to dominate possession." "It's an amazing opportunity for players and supporters alike. I hope the game won't be as bad as the last one, I'm sure it won't." A reminder of tonight's line-ups. Reading make 11 changes from their Saturday defeat by Watford, with Bradford making six from their draw with Notts County. Who has been Bradford's key man in their FA Cup run this season? It would be hard to look beyond Jon Stead (and not just because he's 6ft 3in). Stead has scored in every round so far and is joint top scorer in this season's competition with five goals - along with West Brom's Saido Berahino and Preston's Paul Gallagher. We've made a little video of his FA Cup goals so far. Have your say on Facebook. Live coverage is starting right now on BBC One and is available on this page if you're in the UK. If radio is more your thing, then check out our BBC Radio 5 live commentary. Also on this page. So just how big is this game to the teams involved? Well both sides have only got as far as the semi-final once before. Bradford actually won the tournament back in 1911, but have never reached the last four on any other occasion. And Reading lost to Cardiff in the 1927 semi-finals. The winner tonight faces Arsenal at Wembley for a place in the final. Freddy Harper-Davis: I think Bradford might cause yet another cupset with a 2-1 victory tonight, it is in the air!!!!!! "It's a cup game, anything can happen," says Reading boss Steve Clarke in one of the great cliches. "I don't think the semi-final opposition [Arsenal] makes a difference to either team. I think the reward of getting through to an FA Cup semi-final is big enough in its own right. "Whether you do what [Bradford boss] Phil Parkinson did, I think he played six of the team that started against us at Valley Parade [at the weekend], or whether you do what I did which was change most of the team, it's still a difficult juggling act to get right. "At the end of the night we'll find out who got it right." Kieran Lefeuvre: It will be 2-1 to Bradford. James Farrell: That mean I am missing Eastenders? Former Reading striker Adam Le Fondre, on loan at Bolton from Cardiff: Good luck to everyone at Reading tonight!! Hope they progress! Sunderland goalkeeper Jordan Pickford, recently on loan at Bradford City: Good luck to the Bradford lads tonight hope you get the result! For Bradford City boss Phil Parkinson, tonight is almost like a return home. The 47-year-old played 425 times for Reading between 1992 and 2003. "I have a lot of fond memories from my time there - but obviously the main focus is on the prize of playing Arsenal in the FA Cup semi-finals," he said. "I think some people almost got a bit confused in the first game by classing ourselves as favourites. "Reading probably have a budget 10 times as big as ours and facing them at this stage of the FA Cup is another great challenge for us. "We won't go there in fear. We know the pressure will be on Reading after getting the draw at our place and we can go there and be relaxed in our play without that taking anything away from the intensity of our play." "I think all the pressure's on Reading. They'll have a lot of fans who will expect them to get to a semi-final. But Bradford have enough experience in that squad to cause an upset. I don't think they'll be fearful." Bilal Amirat: Feeling confident, the Bantams have proven to perform under pressure and I'm sure they will do it again in style. Reading have had life somewhat easier so far in the FA Cup. They started two rounds later than Bradford because they're in the Championship and haven't faced a Premier League club yet. They beat Huddersfield in round three, then Cardiff and finally Derby - all away from home. Tonight ends a run of six consecutive away games for Reading in the FA Cup. 40 minutes away from going out of the FA Cup in the first round to neighbouring non-league side Halifax. After that they knocked out another non-league side in Dartford and needed a replay to eliminate Millwall, before famous wins over Chelsea and Sunderland. News from the tunnel via John Southall - a decision at 19:10 GMT to see if the match will be delayed as Bradford City fans stuck in traffic. Both these teams played two days ago in the league so plenty of changes. And I mean plenty. Everyone who started Reading's 4-1 defeat by Watford is out of the team. Pavel Pogrebnyak replaces Yakubu up front. Niall Keown - son of tonight's Match of the Day summariser Martin - is one of the 11 to be dropped. Bradford make six tweaks from their 1-1 draw with Notts County. Andy Halliday and James Hanson are among the players to come in as Mark Yeates and Francois Zoko drop to the bench. Reading: Federici, Gunter, Hector, Pearce, Obita, Williams, Chalobah, McCleary, Mackie, Robson-Kanu, Pogrebnyak. Subs: Norwood, Cox, Yakubu, Karacan, Blackman, Andersen, Cooper. Bradford: Williams, Darby, McArdle, Sheehan, Meredith, Liddle, Morais, Knott, Halliday, Hanson, Stead. Subs: Dolan, Clarke, Zoko, Yeates, MacKenzie, Routis, Urwin. Ross in Watford: Reading fielded half a side against Watford and were thumped 4-1. Respecting the FA Cup or giving up on the Championship? Either way, I hope Bradford make the final. Bradford will be feeling more confident that a team ninth in the third tier ought to be. They have become the biggest lower-league cup specialists of their generation. Since Phil Parkinson took over in August 2011, the Bantams have knocked out 13 sides from higher divisions. including Premier League giants Chelsea and Arsenal. In this season's run, they pulled off one of football's most remarkable comebacks to beat Chelsea 4-2 and then knocked out Sunderland for good measure. Reading fan James Chapman: Having been to Watford on Saturday to watch the reserves get thumped, I'm hoping it was worth it! "TV cameras here for Match of the Day and our build-up on 5 live starts at 7." Is that what the FA Cup is all about, teams not amongst the elite having a shot at glory? Or are you one of those who would prefer an all-Premier League last eight? Are either of these clubs able to beat Arsenal in the semi-finals? the BBC Match of the Day page. So is this page all about me blabbing on about the match? Oh not at all, people, not at all. First of all, you can join in the debate on Twitter, Facebook or texting in and we'll feature as many as we can on this page. From 19:30 GMT you can watch BBC One live coverage and listen to BBC Radio 5 live commentary on this page (if you're in the UK). Or on your TV/radio if you'd prefer. And then during the game, you can watch each goal soon after it hits the back of the net. Tonight's game sees Championship side Reading come up against League One Bradford City for a place at Wembley. "tense and scrappy goalless draw at Valley Parade". That game saw one shot on target on an uneven surface. I'm predicting a much better encounter tonight. Tonight you have a choice. You can either follow a bunch of millionaire internationals play just another league game - Swansea v Liverpool. Or you can watch two clubs battle it out in one of the biggest games in their history - the prize being an FA Cup semi-final at Wembley against Arsenal. And if you still decide you really want the millionaire internationals, we can offer you Pavel Pogrebnyak.